“Elaan of Troyius.” By John Meredyth Lucas. Perf. William Shatner, Leonard Nimoy, DeForest Kelley, Nichelle Nichols, James Doohan, George Takei, Walter Koenig, and France Nguyen Van-Nga. Dir. John Meredyth Lucas. Star Trek. Season 3, episode 13. NBC. 20 December 1968. DVD. Paramount, 2008. The old saying goes, "First Season, Hamlet, Second Season, Romeo and Juliet, Third Season, Taming." Actually, I don't know of an old saying that says that, but perhaps we can start that here (although my attempt to make the phrase "It wouldn't be a cliché if it weren't true" into a cliché never caught on). The old / new saying is at least true of ST: TOS. In this episode, the Enterprise must transport a shrew who needs, at the very least, civilizing, if not actual taming. Or that's what the opening sequence suggests. 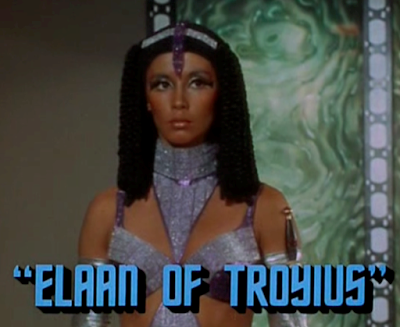 The "Elaan of Troius" episode is frequently cited as a Taming spin-off. But, honestly? It seems to have throwing dishes and not wanting to be married in common with the Elizabeth Taylor film version, but not too much else. On the other hand, that's enough! Enjoy!